Item Number: 810-6-410V 18350 Actual Weight: 0.3 lb. Keyed-different padlocks are lightweight and durable. Temperature tested from -50°F to +350°F. Key retaining ensures padlock is not accidentally left unlocked. Uses FDA approved lubricants safe for use in food processing. 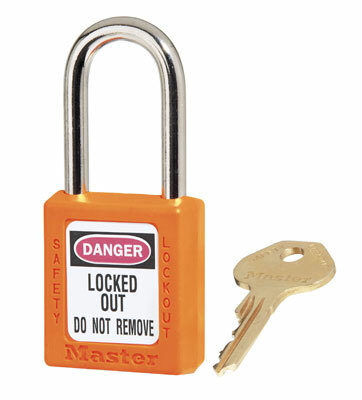 Non-rekeyable to ensure your lockout system stays secure by preventing the accidental introduction of duplicate key codes. Over 40,000 unique safety key codes available. Includes one key for OSHA 1910.147 compliance of one employee, one padlock, one key. Stands up to chemicals, temperature extremes, and is UV stable. Shackle size is 1/4". Shackle clearance is 1-1/2".